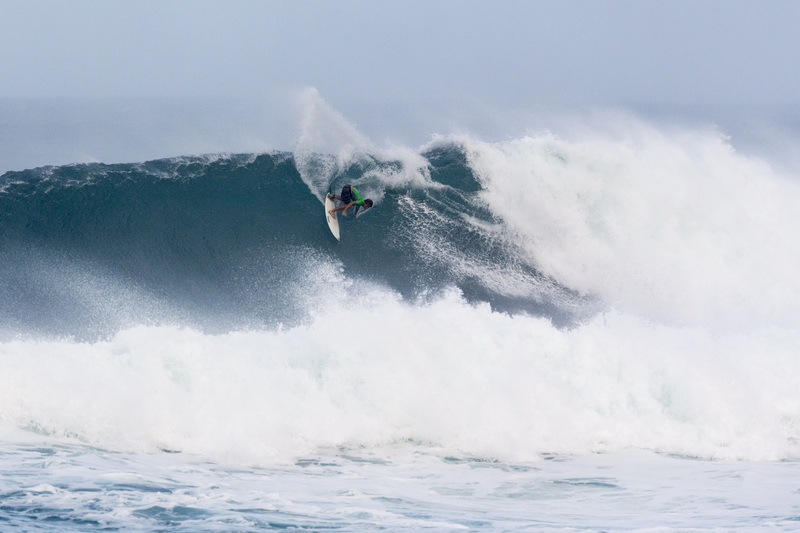 The action continued as massive surf pumped through the Sunset Beach lineup for Day 2 of the Vans World Cup, a World Surf League (WSL) Qualifying Series (QS) 10,000 event and the second gem of the Vans Triple Crown of Surfing. Round Two saw barrels and dramatic wipeouts, however it wasn’t until top seed Matt Wilkinson (AUS) triggered Round Three that the highest single wave score and heat total of the event was dropped in the final heat of the day. Current No. 6 on the Championship Tour (CT), Wilkinson took on the massive surf with a confident backside approach and found a 9.33 (out of a possible 10) for two huge turns to completion on a fifteen-foot inside bowl. He took a commanding lead with a backup score of an 8.77, while Wade Carmichael (AUS) fought off Vans Triple Crown rookie contender Luel Felipe (BRA) and Evan Geiselman (USA) to advance in second. Carmichael keeps his CT hopes alive with today’s advancement into Round 4 and stands to better his current No. 8 position on the QS. The second best score of the day, a 9.0, went to Noe Mar McGonagle (CRI) for a long travel through a heaving barrel in Round Two Heat 10. Barely scratching into the wave, McGonagle faded and slowly edged his way into the tube for a well-timed ride that demonstrated excellent wave knowledge. “It’s been really fun the last few days at Sunset so I felt like finally I’m starting to get to know the wave better this year than the last 3 years I’ve been here, I feel really comfortable and I’m stoked,” commented McGonagle. From Costa Rica, the surfer has grown up on the long left-handed wave of Pavones and had to adjust coming into the chunky rights of Sunset Beach. South African born and long-time resident of the North Shore of Oahu, Benji Brand (HAW), 21, currently leads the WSL Hawaii/Tahiti Nui regional rankings above Finn McGill (HAW), who dropped out of the competition in a disappointing Round 2 loss. Brand is eyeing the coveted champion title, which will be determined at the close of the Vans World Cup. Brand has nabbed multiple 5th place finishes in the region, two being at Sunset Beach (2017 Sunset Open and 2016 HIC Pro) and put in plenty of time to earn a well-deserved place among Hawaii’s best over the years. Only a few surfers can catch up to him to claim the Regional Champion title, including Imaikalani deVault (HAW) who is part of Hawaii’s youthful movement and demonstrated power and flow to advance in first from Round Two Heat 12. DeVault committed to two high-risk maneuvers in the lip for an 8.0 and continued his relaxed attack in the intimidating surf to back up his score with a 6.07 for the heat win. Advancing behind him was Vasco Ribeiro (PRT) with a combined heat total of 11.27 who caused an upset by knocking QS hopeful Mikey Wright (AUS) out of the competition. Cody Young (HAW), 18, had great wave selection during Round Two Heat 9 and was in position for a massive barreling wave, which judges awarded an 8.33 after he stamped out a carve to complete the ride. The young surfer from Maui looked comfortable in the open water and offshore winds due to his experience at Ho‘okipa, the wind surfing capital of the world. This is Young’s second year competing in the Vans Triple Crown and at just 18 years old, has surfed Sunset in nearly every size the wave dishes out. The qualification stories heated up after Jorgann Couzinet (FRA) No. 16 on the QS; Michael February (ZAF), No. 14; and Michael Rodrigues (BRA), No. 11, advanced into Round 3 where they will meet the likes of proven Sunset winner Ezekiel Lau (HAW) and Honolulu’s Keanu Asing (HAW), all equally hungry to be among the world’s best on the 2018 CT.
A third consecutive day of competition looks likely for the Vans World Cup to resume tomorrow as contest organizers anticipate the NW swell to hold out for more contestable surf. A call will be made by 7:30am HST and first in the water will be Round Three Heat 2 featuring Caio Ibelli (BRA), Ian Gouveia (BRA), Raoni Monteiro (BRA) and Maxime Huscenot (FRA). 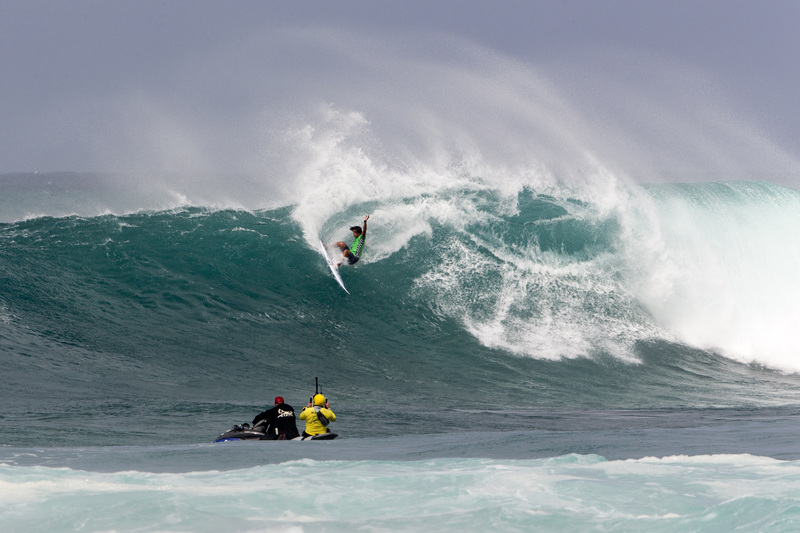 The Vans Triple Crown of Surfing runs from November 12 – December 20 and features three events along the North Shore of Oahu; the Hawaiian Pro, from November 12 – 24, which saw the first Brazilian winner, Filipe Toledo, take out the competition on November 20; the Vans World Cup from November 25 – December 6; and the Billabong Pipe Masters from December 8 – 20, which is also the culminating event of the World Surf League (WSL) Championship Tour (CT). Previous Call to Action: 30K OR BUST . . . SAVE ENCYCLOPEDIA OF SURFING!